Wilga and CR. Harvey Rose with Barbara Seaton. 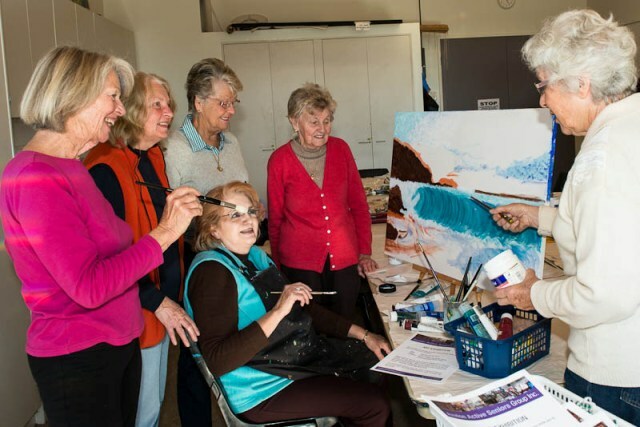 Barbara Tuna, Marianne Curry, Carol Harrison, Joanne Grech, Margaret Lowe and Barbara Seaton at an AASG Art Class prior to the show. 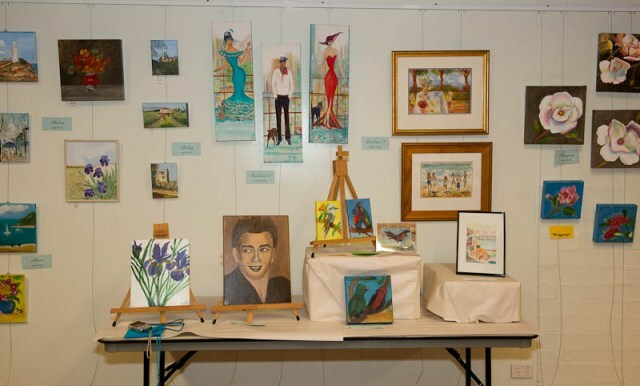 The Art Group of Avalon Active Seniors held their 5th Annual Art Exhibition at the Community Centre in Avalon on Saturday. The display, showing the wide range of talents and interests and artistry of our local seniors was a feast for the eyes. In 2003 eight of the present members of this painting group were part of a class run by a French artist who lived in the area. This lady moved to the North Coast in 2005. The eight artists were having such a great time they decided they weren’t going to disband, so Barbara Seaton rented a room at the Avalon Recreation Centre and everybody contributed to the costs. At the same time the Avalon Active Seniors Group was starting for walkers, a discussion group, and a craft group. Meredith Rasdall, described as a tower of strength, remembered about the eight artists, struggling along upstairs, paying their way, and also knew they couldn’t continue soon due to having to pay a big insurance bill (groups using recreation centres in NSW’s must pay their own Public Liability Insurances etc. each year). Meredith suggested that the artists incorporate themselves within the AASG. So in May 2005 the painting group joined the AASG and are still going. 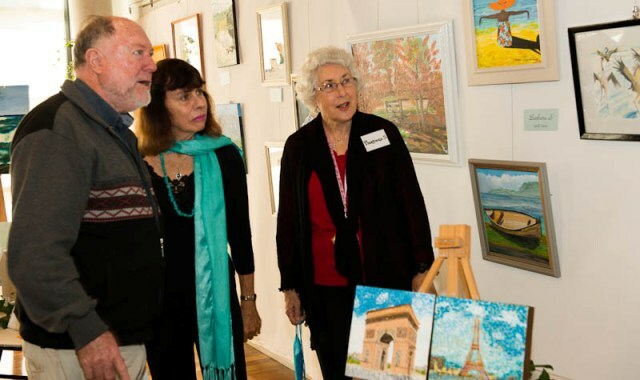 Councillor Harvey Rose, Mayor of Pittwater, had been invited to view the paintings by the artists and spent an enjoyable time Saturday morning perusing this year’s works while he and Mrs Rose chatted with their creators. We asked him what he thought of the paintings the AASG had produced for this, their 5th exhibition. Arthur Murch was an Avalon artist who won the Archibald Prize in 1949 with a portrait of Bonar Dunlop. 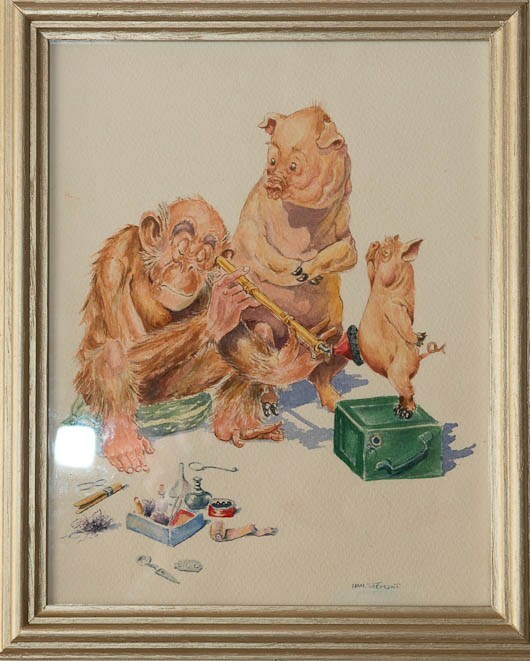 He was also an official war artist during WWII. Local historian Jan Roberts edited a group memoir which was released last year, Remembering Avalon, which has more insights into residents contact with this gent and well worth getting your hands on. Shirley: my inspirations come mostly from travelling; in Italy, in Europe. I like European paintings and painters; Monet, Van Gogh, the Dutch painters. This stems from a family connection. Nan Tremont: I love animals. I have had dogs for 30 years and some of these stem from a book I have had for 60 years by Lawson Wood, ‘Bedtime stories’. The Yorkshire Terrier is my dog Jim; I wet him and set him up and it took hours to take the photo. He was very good. It takes some time to complete the paintings; sometimes in dribs and drabs. The eyes took as long as the rest of the whole painting. Barbara T: that series of three there is a sequence that developed together; I wanted to do a sophisticated lady. Nature is also where I draw inspiration from, Nature and what’s around me. That one is a view from Nada’s (friends home and balcony), the other is a lovely ocean scene. Joanne: I love colourings, bright colours. These two here are of Narrabeen Lakes and at Newport. I love doing faces too, and flowers; these two of Irises and James Dean are for friends; they asked me to do these. I’ve had no lessons and have been painting for 4 years now. June: I love the water. I have no boats in this year but I love doing those. Pittwater is the best waterway in the world; we’ve looked on the whole of the eastern coast and there’s nowhere like here. The AASG is fun and there’s brilliant company while we’re painting. I’ve been painting for 10 years and I’m still learning to paint. Marian: I get my inspirations out of my head and from a feeling; from something that I feel I’d like to do and either develop these ideas or don’t once I’ve felt or thought them through more. I’d like to paint more contemporary paintings but at this stage I only paint dots, alike indigenous works of art. I like the contemporary paintings as there seems to be no start or finish to them; they just go on and on and you keep seeing more and more in them. I have been painting for 2 years. The time it takes for me to complete one varies according to the subject and details, usually weeks for one. Barbara S: everybody comes with their own thoughts; take that one I did I call ‘Seabird’; it just developed from an idea. We get ideas from photos, holidays, magazines. Alison (88 years young and an original member): I get my inspiration from my friends. I love painting birds, I love birds first. I also like painting flowers, I love being in the garden. I’ve been painting since 2005 and as my works are only small they take around 2-3 weeks to complete. 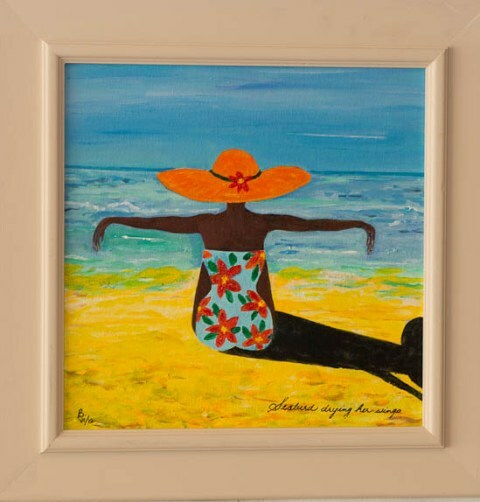 Margaret: my inspirations come from different things that attract me; beach scenes, flowers, landscapes. I also get ideas from magazines, from photos. I find it too difficult to paint outside now so all these are adapted to be able to be done inside. I have been painting for 20 years now. Finishing works depends on the size of the work and the details involved in the subject. I used to paint in oils and now I use acrylics. Due to AASG being a non-profit group none of the beautiful individual works were for sale on Saturday but as you can see, the expression, colours and style of each artist’s nature comes through. Should any of these appeal to you in a ‘like to look at that for longer’ way, you may contact Barbara Seaton at penita@optusnet.com.au with an inquiry. Report b A J Guesdon, Photographs by Michael Mannington of Volunteer Photography.